Well, that’s to say I’ve recently added a couple of new overseas clients. 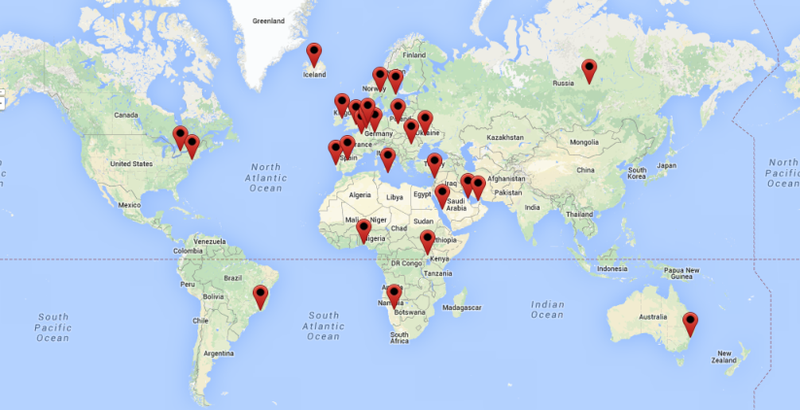 As the map above shows, the list is now up to well over 20, across all continents except for Antarctica. And I’m not holding out my breath for that one, as penguins, petrels and seals don’t have much call for copywriting. My full historic client list is shown above – and not just past clients either. In the last year I’ve done projects for clients in about half the countries shown. If you are based outside the UK and would like a British copywriter for your website, advertising, or to originate or edit your sales collateral, please visit my copywriting for overseas clients page. This entry was posted in International Copywriting and tagged copywriting overseas, international copywriting. Bookmark the permalink.